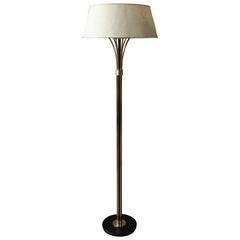 Maison Arlus floor lamp "Model 937" Gilded brass metal shade with its own original diabolo shaped reflector Included a double switch system. The brass arm is flexible and extendable from 150cm to 190cm Rewired with black cotton-insulated cable. 1950s astrolabe floor lamp for Maison Arlus model 926 Original linen shade with it's own original frost reflector glass. Rewired with black cotton-insulated cable. 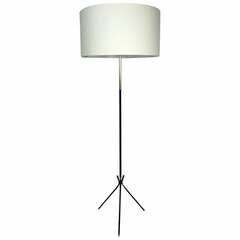 1950s French floor lamp called "Roseaux" "Reeds" Attributed to René Mathieu for Maison Lunel France Rewired with black cotton-insulated cable and four opaline glass shades. 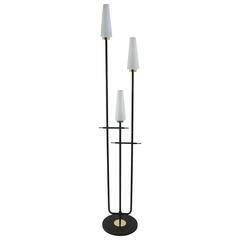 1950 floor lamp by Maison Arlus. 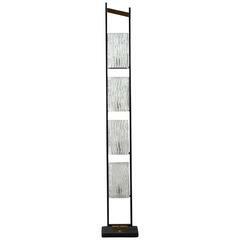 Base in black lacquered iron. Trunk and feet decorated with brass. Wired for European use. 1950s Arlus floor lamp. Composed by three black lacquered stems ended by three conical white satine glass lampshades, highlighted with brass pieces. Three bulbs.